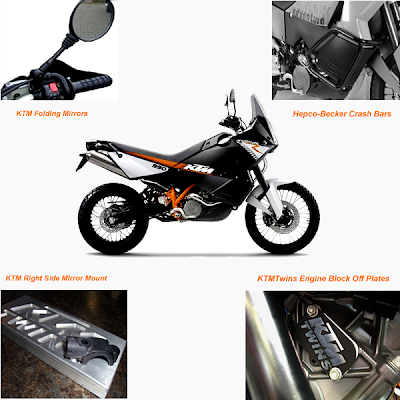 We think there are a couple items that are essential to every KTM 950 and 990 Adventure. We get allot of questions regarding what a new KTM Adventure owner should have on his steed and thought this would be a great idea for a simply blog. I intend on exploring this list for all the bikes we cater to and will go into a more extensive list in future newsletters. As for now though we came up with the Hepco-Becker Crash bars, Right Side Mirror Mount, KTMTwins Engine Block Off Plates and finally KTM's Folding Enduro Mirrors. If you have a special situation coming up and need some advice on what we think you should take with you please feel to contact me at info@ktmtwins.com and I will do my best to get you taken care of.